Irving Rosenfeld is a con man who takes it to a whole new level when he gets a partner in crime Sydney Prosser. They really take things to another level until FBI agent Richie DiMaso manages to foil their plans. Then to stop any sentences they must work for him, which leads them into a dangerous place in New Jersey with the mafia. Now this is a film which has had plenty of trailer time in recent months and plenty of buzz and hype also surrounding it. Which is understandable given the fantastic cast which was put together for it, you are expecting some very good performances and you certainly get that from each member of the cast. They all play well off each other and it really is brilliant to watch from start to finish, it is quite a long film and at times feels long as well. I can understand why though so we get the full story and room for characters to develop. Make sure you pay attention though the plot does have quite a lot of things going on. Because of all the different things going on this is quite a difficult film to review without actually spoiling anything. 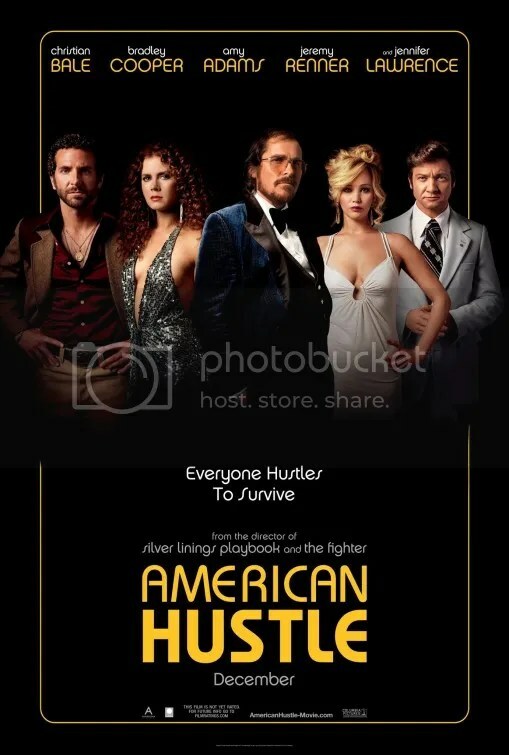 The best way to explain all of the characters is that they definitely live up to the hustle part of the title. They are all playing each other, it just might not be at the same game. Each character has their own motives and reasons behind their actions and in the end are doing every for themselves. I think its safe to say that performance wise Jennifer Lawrence really does end up stealing the show after it seems that she is not actually a big part in the film. But you have to just wait for her to really come into it all and pretty much be the downfall of a lot of things. The question is though does Rosalyn actually realise she is doing it? I think that’s something you can make your own decisions on. Rosalyn is Irvings wife, something we don’t find out about right away which is quite a shock after seeing him fall for his new partner Sydney and wants his life to be around her. Then they casually slip into the story that he’s actually married. That did seem very random as was very unexpected. When Richie gets involved as well we have a few different “love” triangles going on in the story. Everyone seems to be going with everyone else really in what feels rather messed up, but don’t forget what it’s all about the hustle. We have quite a few moments of a story within a story and having to keep track of who the characters are “playing” a different person. Pretty much the con is on comes to mind as they all try to outwit each other. We see Irving really struggling with what has been done to Mayor Carmine, considering he was the one who got him into the messy situation to begin with. I did enjoy this film and thought the performances really were brilliant and the cast worked very well together, it did feel like quite a long film though as I mentioned earlier but that was something that was essential for the film. It doesn’t really take anything away from it. I am becoming less and less convinced with Amy Adams though, she just irritated me in this film (and has done in a few in the past as well) she just seems too wooden in her expressions and acting. Anyone agree or disagree with that? I certainly would recommend this one as it is certainly the start of the “for your consideration” season in the UK. It does have some rather amusing moments and one liners as well, watch out for Bradley Cooper curling his hair! Good review Caz. The whole cast seems to be living it up with the material and make this totally worth while. Even despite the messiness, they make it all work. Yeah those outfits were a bit too much, as we’re some of the random shots as well! I agree that Jennifer Lawerence totally stole the show. She was fabulous. However I found the movie on the whole to be rather disappointing. Everyone acted well and it was a funny movie but I didn’t think there was much of a point to the movie. Was it just to not trust con men because I knew that before the movie. I was also annoyed with how much they veered from the actual events of Abscam but that’s a problem I don’t think many cared about. Anyway nice review! Are you kidding me? Amy Adams let you down?… Wow…. I love her play… And as for Anderson…. She is not bad, but for me she didn’t still Amy’s show. Pretty good movie I agree… And good acting everywhere, just matter of personal taste to say who made it better I guess. Nice review. Really liked this film.